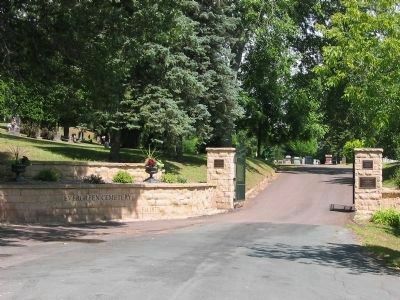 Evergreen Cemetery In 1873, local lumber company Knapp, Stout & Company, Co. provided fifty-two acres to establish a proper burial site. 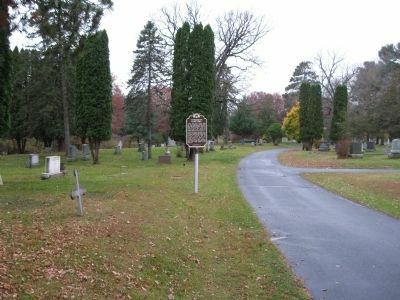 They hired landscape architects, William Merchant Richardson French and Horace Shaler Cleveland, to design the cemetery. French's plan reflects the Rural Romantic style, following the natural contours of the land and incorporating native trees and shrubs. 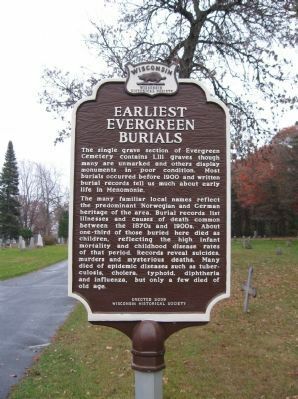 1900 and written burial records tell us much about early life in Menomonie. Location. 44° 53.324′ N, 91° 54.53′ W. Marker is in Menomonie, Wisconsin, in Dunn County. Marker can be reached from North 5th Avenue / Evergreen Cemetery Road, 0.6 miles north of Northeast 13th Street and Shorewood Drive. Touch for map. 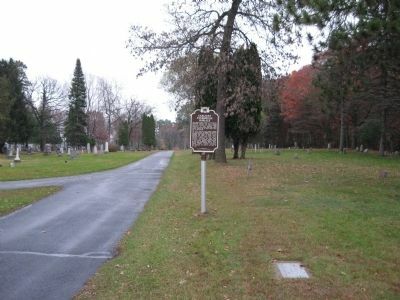 Marker is located at the east side of Evergreen Cemetery. Marker is in this post office area: Menomonie WI 54751, United States of America. Touch for directions. measured in a direct line); Stori House (approx. 1.2 miles away); Chippewa Valley White Pine (approx. 1.2 miles away); In Honor of Company H (approx. 1.2 miles away); Mabel Tainter Memorial (approx. 1.3 miles away); Fine Meadows (approx. 1.3 miles away); Dunn County Veterans Memorial (approx. 1.3 miles away); Wisconsin's Oak Savanna (approx. 1.3 miles away). Touch for a list and map of all markers in Menomonie. [plaque on left pillar] This property is listed in the National Register of Historic Places by the United States Department of the Interior. More. 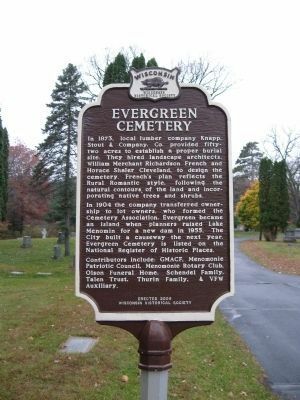 Search the internet for Evergreen Cemetery / Earliest Evergreen Burials. Credits. This page was last revised on June 16, 2016. This page originally submitted on October 29, 2010, by Keith L of Wisconsin Rapids, Wisconsin. This page has been viewed 860 times since then and 6 times this year. Last updated on September 12, 2015, by Devon Polzar of Port Washington, Wisconsin. Photos: 1, 2, 3, 4, 5. submitted on October 29, 2010, by Keith L of Wisconsin Rapids, Wisconsin. • Bill Pfingsten was the editor who published this page.